Masatake Terauchi (寺内正毅, 1852– 1919) was a Field Marshal in the Imperial Japanese Army and the 18th Prime Minister of Japan from October 9, 1916 (Taisho 5) to September 29, 1918 (Taisho 7). After the assassination of Hirobumi Ito, Terauchi was appointed as the third and last Japanese Resident-General of Korea. 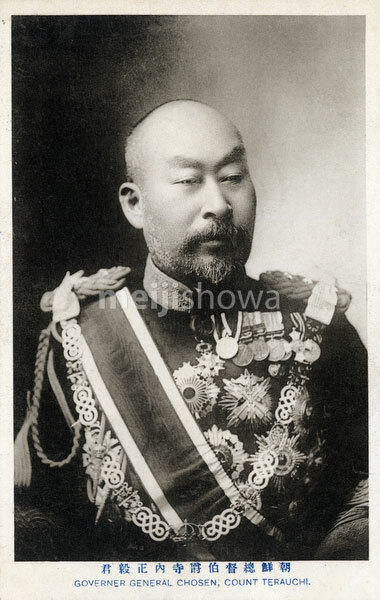 In 1910 (Meiji 43), he executed the Japan-Korea Annexation Treaty and became the first Japanese Governor-General of Korea.